Set sail for the JW Marriott Desert Springs Resort & Spa for an especially splashy way to enjoy the season. Set sail for the JW Marriott Desert Springs Resort & Spa for an especially splashy way to enjoy the season. 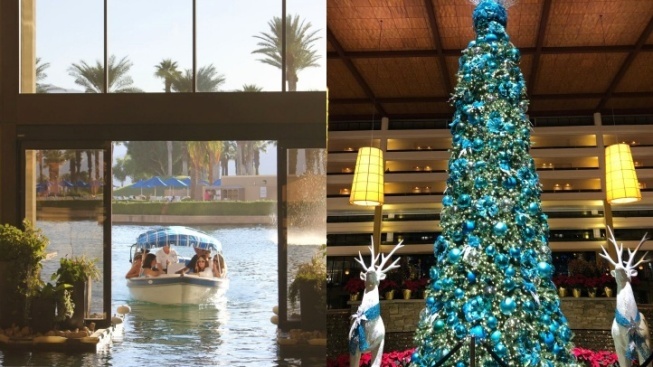 The boat rides are happening on select December days, alongside other merry to-dos around the property. FA, LA, LARKS AFOOT... around the resort, including a "LEGO-inspired gingerbread house" to snap pics with and a Winter Fresh Body Polish treatment at the spa. Are you and your honey thinking of doing the desert for the holiday? Or does the fam need to soak in some sunbeams? Swing by the resort's site for more on its offbeat boatly offering, a holiday happening that feels slightly magical. After all, a boat in the desert sounds like something straight from a storybook found inside a stocking.